If you enjoy having yuccas in your landscape but would like a little variety, do not despair. There is an assortment of similar plants that can be used in place of or in addition to the yucca. Like the yucca, these sun-loving succulents require little maintenance. When planted together, these plants compliment each other and add interest to the landscape. When used alone, they provide an attractive focal point. Yuccas and other similar plants go well together in a desert landscape. Commonly known as the century plant, the agave has large succulent leaves that are edged with teeth and have a sharp spine on the tip. Two of the more popular landscaping choices are the Agave Americana and Agave havardiana. Garden specimens range from a foot or less to over 6 feet tall and about 4 feet wide. Depending on the type of agave, color may vary from shades of green to blue-gray. Usually it takes from five to 40 years for the plant to bloom. A spectacular flower stalk emerges from the center of the plant. It is so large it zaps all the nutrients from the mother plant. After blooming, the plant dies, leaving many small agaves around its base. These offsets can be removed and transplanted. Due to its large size, a single agave is often used as the focal point in a landscape. Although not a true yucca, Hesperaloe parvilflora, or red yucca, compliments a desert landscape.This plant has long, narrow, blade-like leaves with curly fibers along the edges. The plants grow about 2 to 3 feet high and spread about 4 feet wide. From spring until fall, red bell-shaped blooms appear on 8-foot-tall flower stalks. These beautiful red flowers attract hummingbirds. After blooming, large green pods full of black shiny seeds remain on the stalks for propagation. Clusters of two or three red yuccas are often planted together. Dasylirion texanum, commonly known as Texas sotol or desert spoon is a grassy succulent that has narrow, light green leaves with edges like the teeth of a saw blade. The slender leaves grow from a central trunk. Tall flower stalks are often 9 to 15 feet tall. A yellowish bloom is produced from May to August which attracts hummingbirds. Propagation is by seed or removal of offsets. These plants are often used either in masses or as focal points. 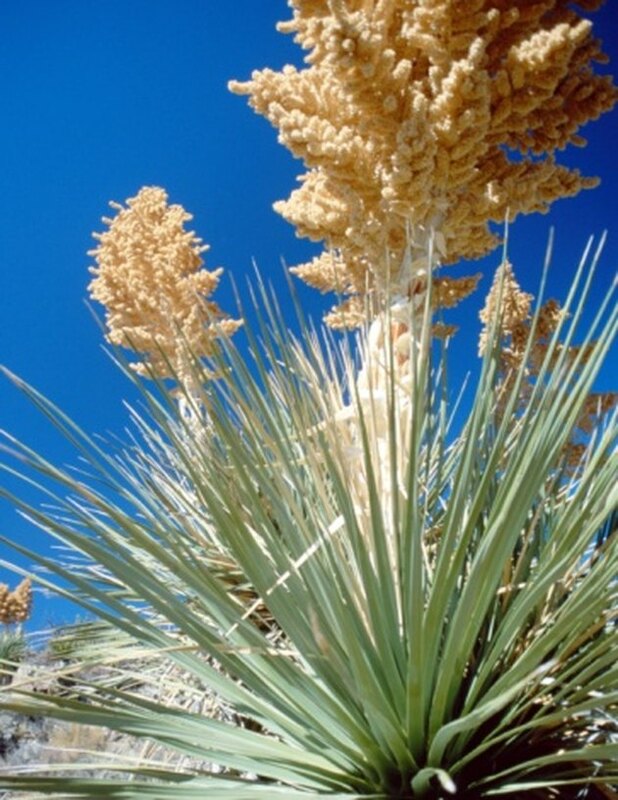 The Nolina microcarpa, also commonly called beargrass or sawgrass, has bluish-green foliage. Its long leaf blades are tipped with curly fibers and are an attractive contrast to the large bulky leaves of yuccas and agaves. Although there are no visible teeth along the leaf margin, the raspy edges can cut like a razor. These plants grow to about 6 feet in height and can spread to 8 feet in width. From May through June, dense clusters of white, plume-like blooms appear on tall flower stalks. Propagation is by seeds or removal of offsets. These bushy plants are often used as accent pieces. They do well on hillsides and are sturdy enough to withstand high winds. Cassandra Walters is a professional educator and freelance writer. She co-edited a published novel and elementary curricula, and covers DIY projects and home-and-garden topics in her articles. Walters graduated from Pan American University with a Bachelor of Arts in education and a minor in English.